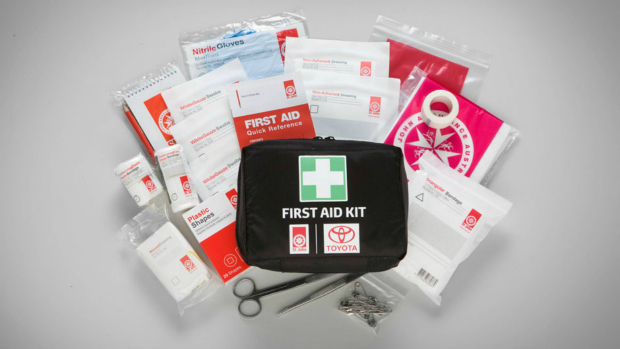 Below are a selection of Toyota factory accessories for the Tarago. Make a No Obligation Enquiry for more information on availability and compatibility with your vehicle. 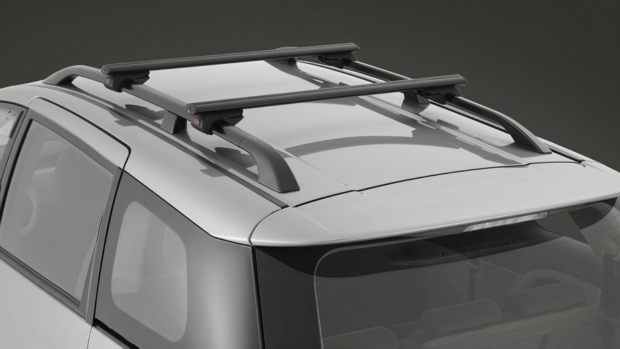 Carry boards, baggage or anything up to 75kg evenly distributed on the Toyota Genuine Aero Roof Racks. Corrosion resistant in black anodised aluminium, they also feature rubber cushioning to protect your cargo and have secure key locking end caps. The Toyota Genuine Alloy Wheel Lock Nut Set means your alloys can be securely locked, protecting them from would-be thieves. 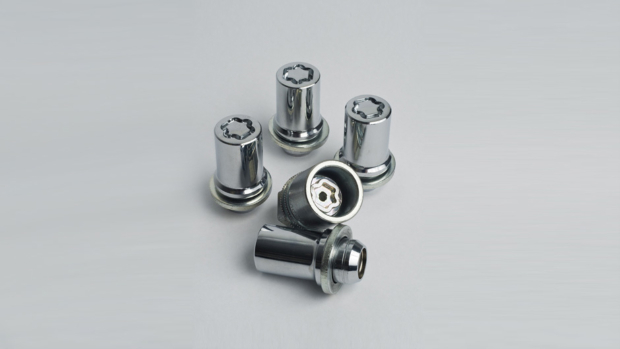 The strong, premium-quality chrome-plated Wheel Nuts come with a unique secure-coded key to lock the alloys in place without detracting from their style and appearance. No matter what the weather is like, you can enjoy fresh air with Toyota Genuine Front Weathershields. 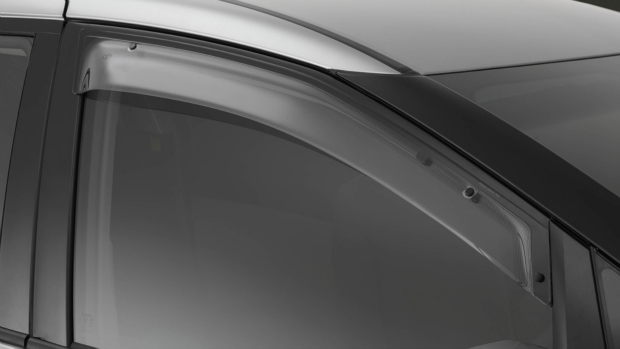 The aerodynamic design minimises wind noise whilst maximising protection from wind and rain, and their lightly tinted UV-resistant acrylic also reduces glare. 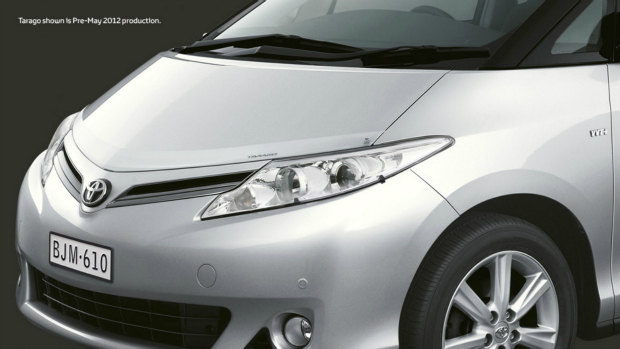 Help protect your Tarago's bonnet and headlamps from stone chips and damage with Toyota Genuine Headlamp Covers and Bonnet Protectors. They're made from high strength, clear acrylic that is resistant to cracking and UV discolouration. Better still, they are easy to remove for cleaning. Reverse parking can be a challenge at the best of times. But Toyota Genuine ParkAssist can make even the tightest parking spot easy to negotiate. Four discreet colour-coded, ultrasonic sensors mounted in the rear bumper activate an audible 'beep' in the cabin that increases in frequency the closer your Tarago reverses towards objects behind it. Avoid one carpark dent or scratch and this accessory virtually pays for itself. GLi 4cyl model shown. Including Towball & Trailer Wiring Harness. 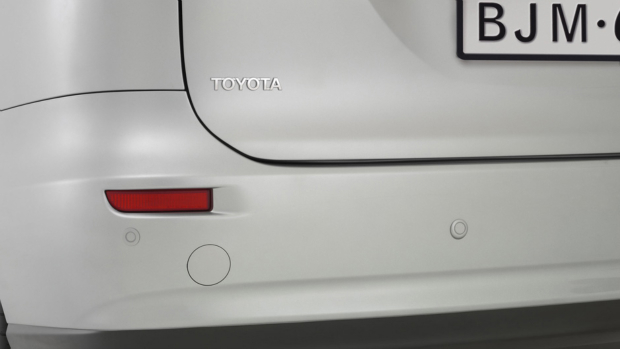 The Toyota Genuine Towbar with Rear Step and Chrome Loop Protectors will allow you to tow with confidence. 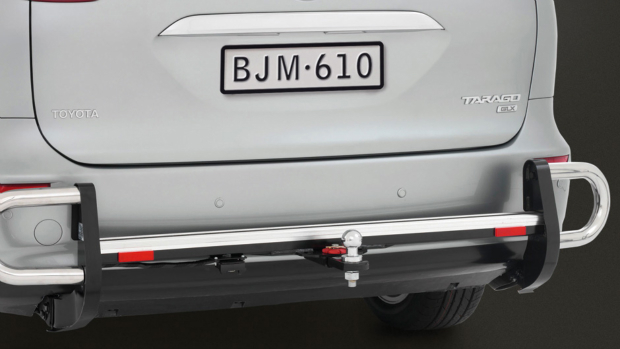 Providing rear corner protection and an anti-slip extruded aluminium platform, it blends stylishly with the Tarago's rear whilst delivering maximum towing capacities of 1600kg (braked) and 600kg (unbraked) with a 160kg maximum ball download. Choose between 3 types of Trailer Wiring Harness plug styles, which incorporates a sophisticated electronic control module for dependable integration with your Tarago's electrical system. Towball also available (sold separately). Fitment requires Factory Fitted Sonar to be deactivated on GLX and Ultima. 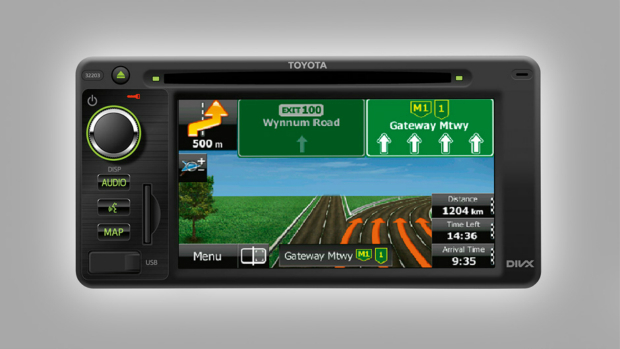 Audio Visual Unit with Satellite Navigation^ Find an easier route home with the guidance of the Toyota Genuine Satellite Navigation Audio System[N1]. Equipped with Suna(TM) Traffic[G7] the navigation system receives traffic updates 24/7, so it can navigate alternative routes around traffic congestion and landmarks can be displayed in 3D for easier recognition. The audio system allows you to play from some iPods(R)[G5] [G8], iPhones(R)[G5] [G8] USB[G5] or CD, and the full-colour touch-screen display features a simplified audio track search and album jacket display (for some iPods(R)[G5] [G8] and iPhones(R)[G5] [G8]). Voice control function allows you to select audio by the artist name (for some iPods(R)[G5] [G8] and iPhones(R)[G5] [G8]) or make phone calls, and the FM radio is capable of displaying the station name and song name. Also compatible with the Toyota Genuine reversing camera (optional). Standard on Ultima. [G7] SUNA(TM) GPS Traffic Updates are only available in metropolitan Adelaide, Brisbane, Canberra, Gold Coast, Melbourne, Perth and Sydney; it operates from information provided by Intelematics Australia and may not cover all road incidents and congestion. Please see www.sunatraffic.com.au for details. [G8] iPod(R), iPod Touch(R), iPad(R) and iPhone(R) are trade marks of Apple Inc.
For extra safety and confidence when reversing, the Rear View Camera gives you a clear visual picture of what would usually be out of line-of-sight and projects the view at the rear of the vehicle onto an Electrochromatic Rear View Mirror or Satellite Navigation screen. 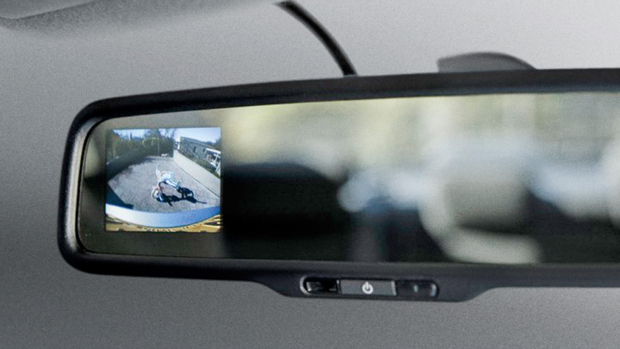 When activated, the mirror features a 50mm x 38 mm colour LCD screen with images provided by the Rear View Camera, keeping you aware of any obstacles at the rear of the vehicle. When not in use, the LCD screen is invisible to the eye and the entire area of the Electrochromatic Mirror works as a mirror. All the right pressure, with none of the stress. Dash-mounted, backlit, small and sophisticated, the system's display receives data wirelessly from sensors mounted inside each wheel. 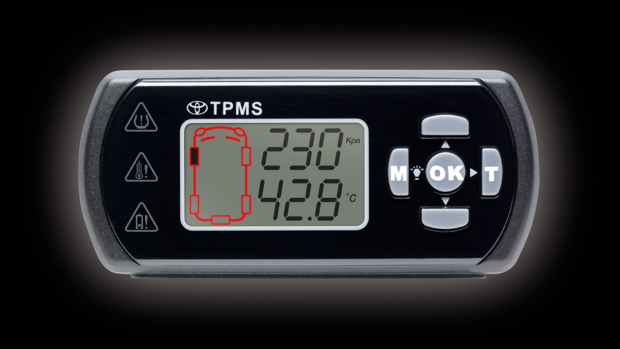 Temperature and pressure of all five tyres (including the spare wheel) are sequentially displayed in various measuring units. Advanced functions allow for wheel rotations and a variety of display models. 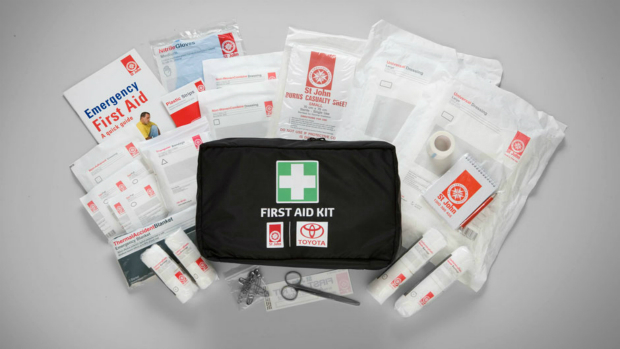 There are even programmable alarms for low tyre pressure, tyre over-temperature and sensor battery replacement.